A copy of an email advertisement for Book-to-tax feature. This is an excerpt from today’s help chat. I replaced the representative’s name with “INTUIT” for that person’s privacy. Emphasis is also added. Tony Novak: Next question: Book to Tax tab says “The new books to tax experience is coming! We’ll shortly be bringing you a brand new experience to help you transfer your book balances to Intuit Tax Online. You can check back here, but we’ll also notify you via email when it’s ready.” It has been that way for a few weeks. What’s up with that? INTUIT: The option is still not available. INTUIT: You can always try to add your account to the tax option and verify if the system will allow you to do so. Tony Novak: I used to be able to generate an income report that was broken down by tax line assignment. That report appears to be missing now? Tony Novak: Yes, I think so. It was a report listed in Accountant’s Reports called a “Tax Report” or something similar. I don’t see anything like this now. Tony Novak: How do I get an income report that shows transactions by tax line assignment? INTUIT: In QBO, that report is not available. Tony Novak: Then what is the purpose of assigning tax lines to each income and expense account in account setup? 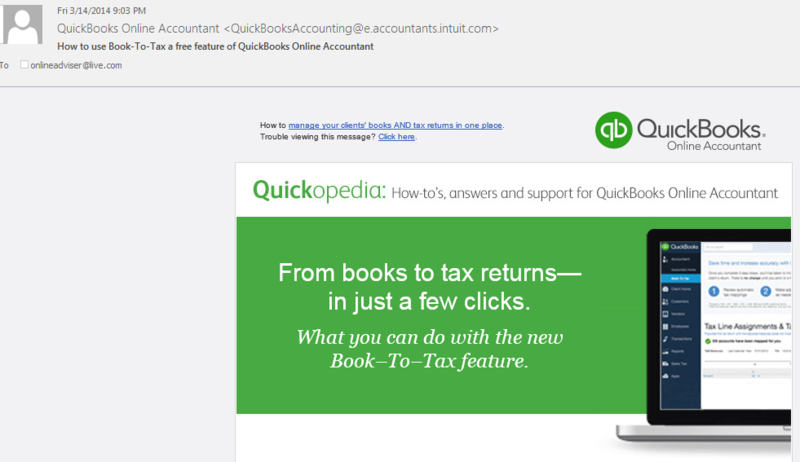 INTUIT: The Book to Tax option has tax line assignments, but that will be available when your QBOA account is upgraded. INTUIT: We don’t have dates for individual accounts. The update will happen in stages over the next several months and accounts are chosen at random for each stage. Tony Novak: OK thanks. Bye. So the bottom line is that it appears that Intuit removed the tax assignments of all accounts when they were converted to the new QuickBooks online or they simply removed the tax reports feature that I’ve relied upon for years to produce business tax returns (I don’t know which but it has the same effect) and has not replaced it with any usable replacement while we are in the middle of tax season!!! Is it just me or is this simply idiotic and unacceptable?